I really love the all of the different types of curries from all over the world, such as Indian, Jamaican, Middle eastern, and Asian. I especially love Thai cuisine so this easy to make recipe is my version of this Southeast Asian dish. Enjoy! In a bowl, whisk the coconut milk with the curry paste and fish sauce until well combined. Heat a large skillet until very hot. Add 2 tablespoons of the vegetable oil and heat until just smoking. Season the chicken with salt and pepper and add it to the skillet in a single layer. Cook until the chicken is browned but not cooked through, 4 to 5 minutes. Transfer the chicken to a plate and pour off the fat in the skillet. Add the remaining 1 tablespoon of vegetable oil to the skillet. Stir in the ginger, lemongrass, and garlic, stir-fry for 1-2 minutes scraping up browned bits. Add the chicken, chili peppers, red curry mixture and the stock and bring to a boil. Reduce heat and simmer for 8-10 minutes or until the chicken is cooked through. Add the kale strips and simmer an additional 5-6 minutes, taste and adjust seasonings. Transfer sauce and chicken to a large bowl and serve in smaller bowls with steamed Jasmine rice and garnish with Thai basil leaves. Bon Appetit! 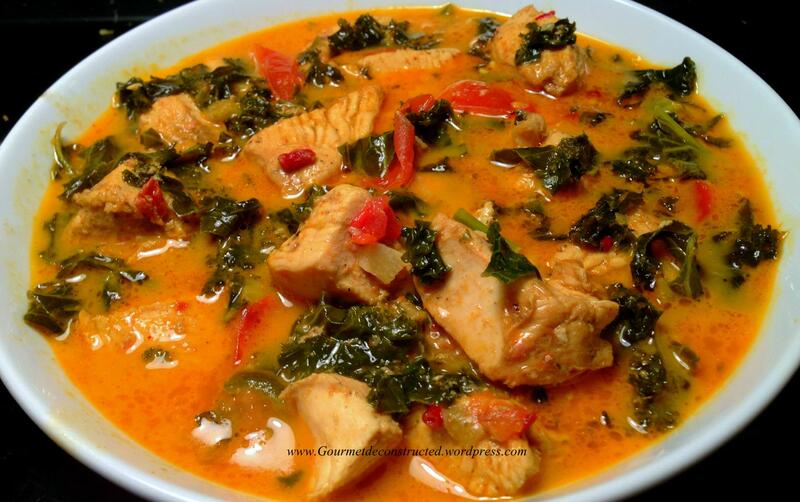 Posted on January 24, 2016, in Food, Poultry and tagged chicken, chili pepper, coconut milk, curry, fish sauce, ginger, jasmine rice, kale, lemongrass, red curry paste, Thai, thai cuisine. Bookmark the permalink. Leave a comment.